Photograph-Don’t wait until the next time! This has happened to me several times in my travels, around town, downtown and on trips. Seeing an unusual building or something unique. Maybe you do not have the time, or the light is bad, I can get it tomorrow. These are the excuses I have used in my mind a number of times, to not photograph. The photo I have attached is a good example. We will always have clowns, but we wont always have elephants. 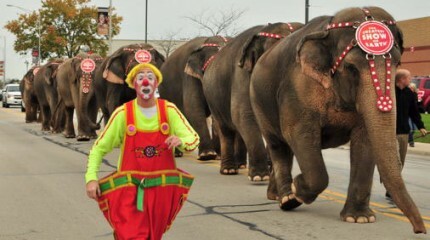 The Circus comes to town every year and they did have elephants as an act. They are walked down the street. Maybe it was a way for the pachyderms to get exercise, but it was not every day you saw elephants walking down the street. The circus is a magical experience for every Family to experience and an event that every child will forever remember. Now, the human performers can undoubtedly pull off some pretty spectacular stunts, but without a doubt the true stars of the show are The Ringling Brothers’ animals. The circus has a large herd of Asian elephants and a whole menagerie of other beautiful creatures including lions and tigers. We have no excuse why not to photograph, because most phones today have a decent camera on board. Whether you shoot video or stills, take the image. You will regret later you did not. Remember to keep you images simple and remove distracting backgrounds. Get closer to your subject, fill the frame. Take more than one photograph if possible. Move around the subject, and do not get run over by the cops like I did photographing the elephants. I walked right in front of a squad car.